This page describes the ride from Colorado Springs, CO to Lake City, CO. Most of the ride is on graded dirt roads which are passable on bikes carrying a modest amount of baggage. If you want to ride a fully loaded bike and you are experienced with riding a fully loaded bike on dirt roads, you probably won't have a problem. If you average 25 MPH, then you could do the route in 10 hours straight through. I think many parts will be 30-35 MPH, so even with a gas and food stop, it would be under 10 hours. If you're riding an unloaded bike, you could probably do the entire trip in 6 hours. Stopping short of Lake City to camp would allow a more leisurely pace (pics and sightseeing). 3. Filtered to 499 points or less without time for each track point - MapSource/BaseCamp don't want time. Download the version you want or get them all; they're small enough. (I'm still looking into this time/no-time situation, but this is all I can find out right now.) The filtered tracks are filtered to 499 points, so they should work with any modern GPSr. I'm using tracks instead of routes because tracks do not change and are not subject to recalculation like routes are. * these files are not filtered; they had under 499 points to start with. In this narrative, I tell about some of the sites and landmarks and give some mileages to help you along your way. I do not tell all mileages and turns; it is an adventure, after all. I have chosen the starting point in Colorado Springs at a place that is easily located and identified - the Cheyenne Mountain Junior High School (corner Cheyenne Blvd and Cresta Rd). 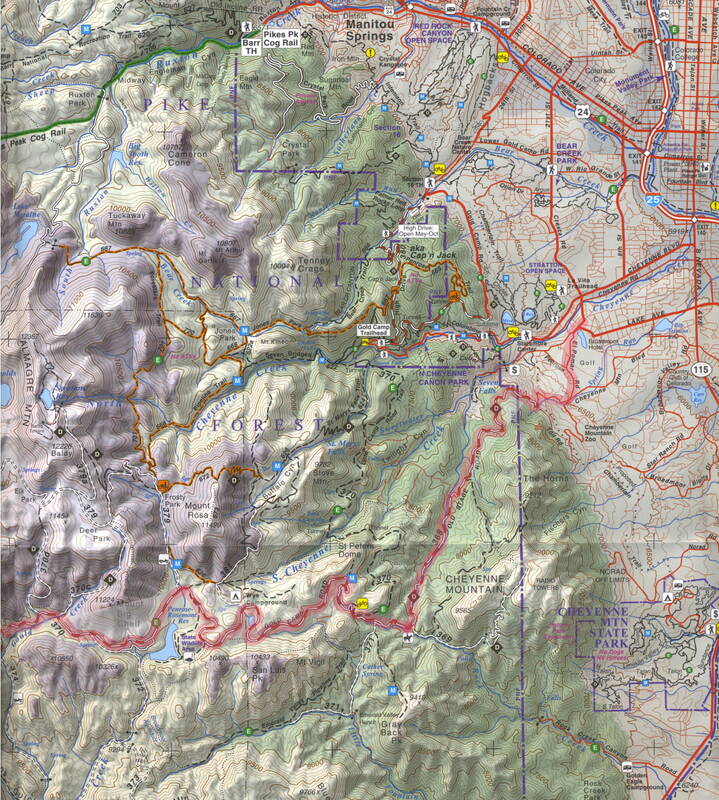 The ride goes through the Broadmoor residential area and around the Broadmoor complex as it climbs steadily to the dirt section named Old Stage Rd (see the sidebar on Old Stage Rd and Gold Camp Rd). When you hit the dirt section, the road pitches up and when I last rode it, it was covered with speed/braking bumps, the small 1-4 inch ripples in the surface created by braking and acceleration. This may be disconcerting to some. The historic Gold Camp Rd runs from Colorado Springs to Victor. Part of the road goes through tunnels and other parts of the road are just plain difficult. 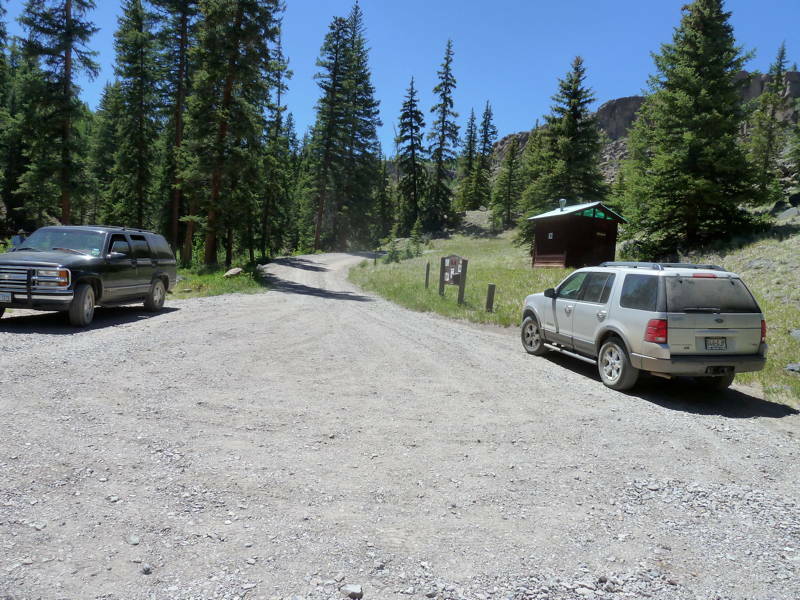 This part of Gold Camp Rd is closed to motor vehicles, but open to street-legal motorcycles. However, the 'closed' section is difficult for larger motorcycles and for those loaded with gear. You must ride over one blocked tunnel and this is difficult for some. I recommend that if you have any doubt about riding the 'closed' section of Gold Camp Rd, you instead ride Old Stage Rd, which bypasses the 'closed' section and joins Gold Camp Rd at the easier part of the road. This is the route described in this ride. The road has steep drop-offs on the right but is wide enough for two automobiles to pass each other. I frequently encountered downhill traffic that was going fast enough to alarm me, so stay to the right but don't get too far right (gulp). Soon enough, you top out from the steep part and continue on a less-steep road, passing private driveways and side roads. You may spot the Stables at Broadmoor which has, besides horses, the Stage Stop Cafe (burgers and sandwiches, 10am-5pm). Click on the picture to view part of the 'Old Stage Rd and Gold Camp Rd' route and/or right-click to save a copy. The route is marked with a wide, light-pink, semi-transparent highlight, like a pink highlighter. This small map is part of the 'Trails Illustrated Pikes Peak, Canon City #137' map; see also the list of good maps at the bottom of the page. About a mile past the stables is a turn off to the right. The side road splits; the left fork goes to a partially collapsed tunnel and the right fork goes to a pipe gate. I advise not going into the tunnel. The pipe gate marks the top end of the 'closed' section of Gold Camp Rd. If you had a suitable moto, you could ride this road back down to Colorado Springs. Back out on the main road, it changes at this intersection from Old Stage Rd to Gold Camp Rd. After another mile, you'll come to a pull-out on the right with a view of Colorado Springs - photo-op. The road is fairly level from this point to the end, but is bumpy and rocky in places. About 12 miles further and you'll pass through Clyde and the only tunnel on the open section of Gold Camp Rd. Notice the internal braces that have been added recently. After about 7 more miles, you'll turn left onto the highway and drive about 4 miles to Victor. Passing through Victor, check out the old shops and businesses. I'd like to stay at the Victor Hotel one day. 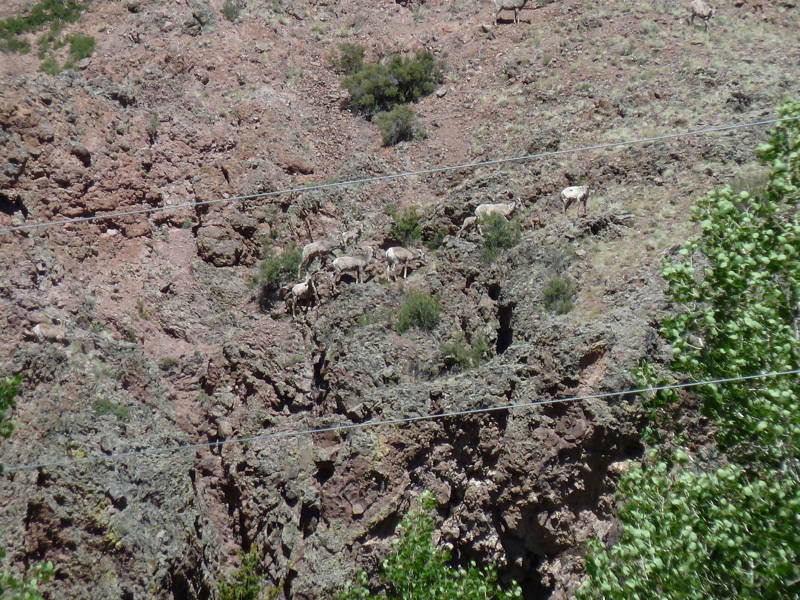 The drive to Cripple Creek (about 5 miles) takes you on a very large bridge below the mine tailings; if you look, you may see trucks dumping residue. As you approach Cripple Creek, be ready for the sharp left turn onto Shelf Rd; you may go into Cripple Creek, but it's not on the track log. Ride the Shelf Rd about 16 miles down to Red Canyon Park (look for the arch about half way down), paying attention to the turn into the not-well-marked entry to Red Canyon Park. Follow the road to a rest stop at the toilets. After a short break, ride through Red Canyon Park to the west, paying attention to the track to avoid wrong turns. You will climb one not-too-steep rocky hill and cross one not-too-deep water crossing on this section. After about 20 miles, you'll reach Highway 9. Turn right and ride about 2.25 miles to a major turnoff to the left. You're now on the last 43 mile dirt stretch to Salida. Eventually you'll see Fremont County Rd 2 signs that continue until you reach Chaffee County at a cattle guard. Follow the road downhill and out of the mountains to Highway 291. Turn left and ride into Salida. The track takes you into Salida on 1st Street, turning right at the stop light onto F Street, and going south to Highway 50. You may want to stop for food in town or out on Highway 50. Gas is available just as you enter the downtown part of Salida and out on Highway 50. Eventually you'll be on Highway 50 to Poncha Springs, about 5 miles away. Pass by WalMart. 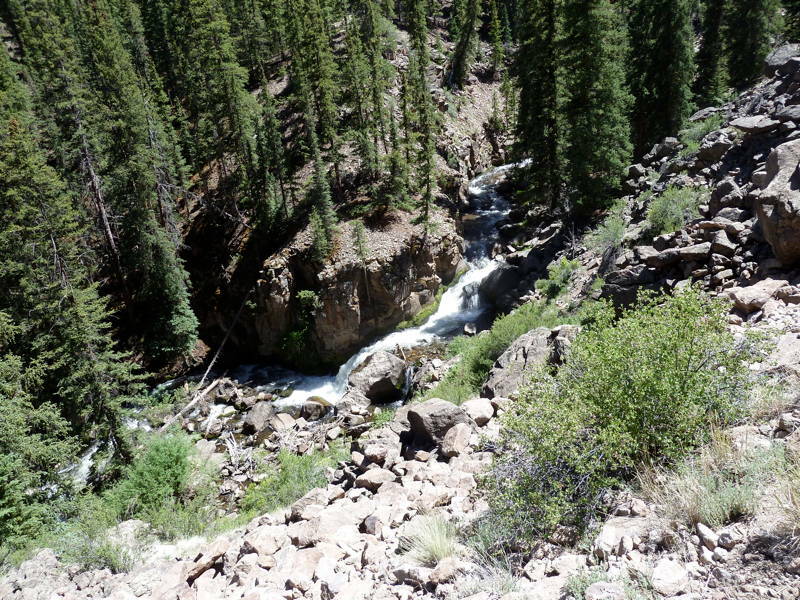 At Poncha Springs, turn left onto Highway 285 (at the T) and ride about 5 miles south to Mears Junction and the road to Marshall Pass. Turn right onto Forest Rd 200 and ride about 2 miles to a right turn, still on FR200 to Marshall Pass. The road to Marshall Pass and then on to Sargents is well graded and has a nice view at the pass. The last food and gas is at Sargents, so fill up NOW. At Sargents, you must backtrack about 1.25 miles to the east on Highway 50 to the Tomichi Cr Rd turnoff (CR888). Be careful of the downhill traffic coming at you as you turn off of Highway 50. 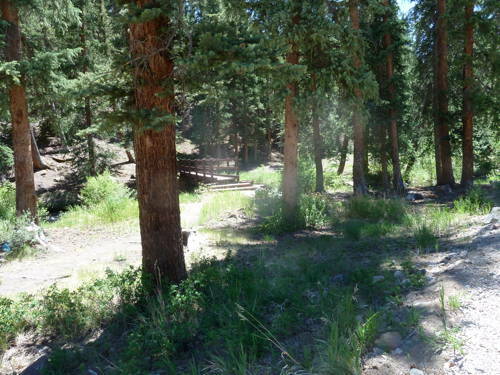 Follow the track to the Black Sage Pass turnoff, then over to Waunita Park as you ride around Tomichi Dome. Pass the Waunita Hot Springs Guest Ranch and wave to the cowgirl guides as you ride by. Eventually you'll reach Highway 50 again; turn left and ride to Doyleville (.7 mile), then turn right off of Highway 50 and onto CR45 for the ride to Highway 114 (about 17 miles). 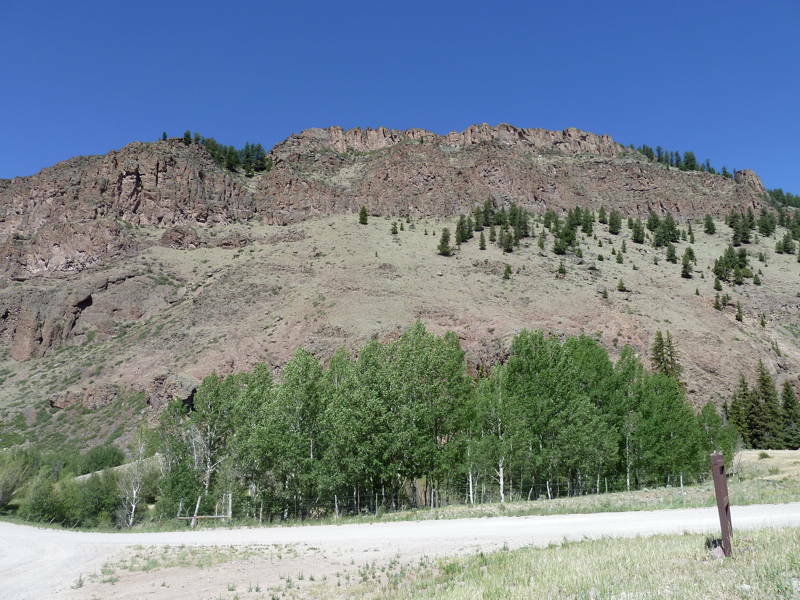 At Highway 114, turn left and ride for about 1.25 miles, then turn right onto CR45 and the last 42 mile dirt stretch to Slumgullion Pass. Pass the Old Agency Work Center in the middle of nowhere. At the highway, turn right and follow the signs to Lake City. You can get US Forest Service MVUMs (free) and/or visitor maps (about $10 each) from USFS Ranger District offices. MVUM = Motor Vehicle Use Map - shows which roads and trails are open to motorized use in the US National Forests (motorcycle, ATV, UTV, Side-by-side). Visitor maps show all routes, motorized and non, plus geographic info including streams, rivers, and lakes, major mountain peaks, and more. Each of these forests has a web site where MVUMs are available electronically. You can also call each Ranger District office and ask for the paper MVUM and they will mail it to you for free. Ask for 5 each; they're flimsy. My buddy DaveB and I decided to ride down to Lake City as a check ride on the 5SARGENTS track. We hauled our bikes down to hiway 114 and drove in a ways to find a quiet place to unload and leave the moto-hauler. We hauled instead of riding to save some time and allow us to have a more leisurely ride; it was to be about a 90 mile round-trip ride but with a side excursion or two, ended up about 105 miles. This was at [38.20077896118164, 106.838249206543] WGS84, give or take a few feet. 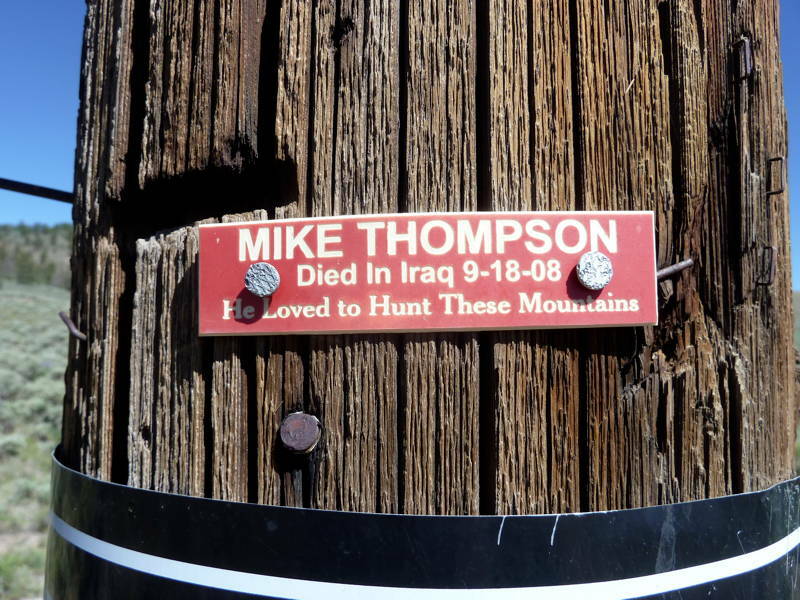 The map shows a grave nearby, but I don't think it's Mister Thompson. Riding south, we rode over Los Pinos Pass and had this view. At Cathedral, we stopped to look at the rocky hill and Dave spotted these critters. Continuing, we enjoyed the ride along Cebolla Cr and Hidden Valley, the lush green fields in stark contrast to the rocky hills nearby. Soon we hit the highway into Lake City and began the rapid descent thereto. Watch out for gravel on the road... In Lake City, we stopped in at the visitor center and picked up a few maps, then had burgers at the Cannibal Grill. They were just average. Next time I visit, I'm goin to the Southern Vittles; I hear it's got more variety. On our return leg, we checked out a few campsites/campgrounds. There is a CG at the Slumgullion Pass intersection and another several miles north (Deer Lakes) (both are fee CGs). There were a few others along the road. 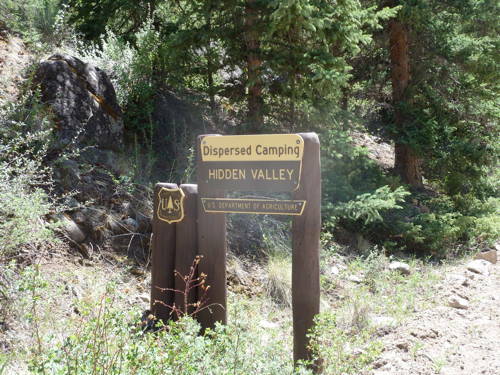 But the one I would stay at is the Hidden Valley Dispersed Camping site. Keep a sharp eye out for the sign on the east/south side of the road; it's easy to miss. There's a toilet and two or three sites, each with a table and fire ring. There's even a bridge across the impressive creek which runs along the campgrounds. And it's free, too. View of the creek below the campsite. We had an uneventful return to the moto-hauler and were soon back in the heat of Salida. Dave and I both enjoyed the ride and decided we'd like to do it again in the fall or next spring when it's cooler. 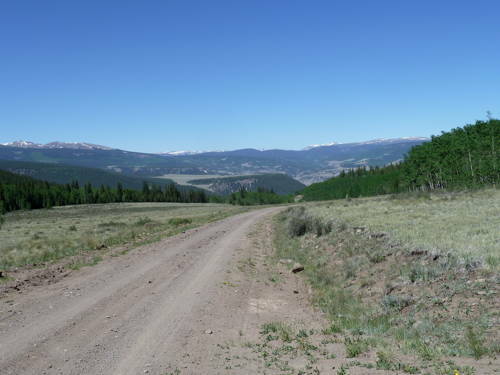 And we'd do lots more exploring of side roads and other sights along the way (inactive mines, old ranches, etc). The country out that way is plenty spacious and will surely hold a secret or two for us to discover. Oh, forgot to mention; the 5SARGENTS track is spot on!